Visit one of our Safe Showrooms located throughout Southern California to see these safes in person. When you want the best, none other will do. 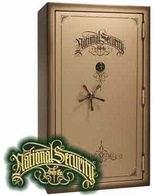 Liberty's National Security home and gun safes are hand-crafted one at a time to provide unsurpassed protection from theft and fire for your valuable collectibles, heirlooms, and personal assets. "Nobody beats a Liberty. 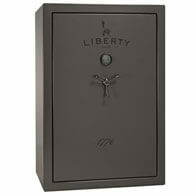 Ranking #1 as America's top producers of Gun Safes for almost 20 years, nobody beats Liberty Safe. Over 2 million people have now chosen Liberty Safe as their Gun Safe of choice and after reading the more than 15,000 reviews, it's so crystal clear obvious as to why everyone chooses Liberty. Liberty's 98% Approval rating with the country's #1 rated lifetime warranty, Liberty truly takes care of their customers. With a Gun Safe for every size and budget, Liberty has over 30 different Gun Safe models in over 2 dozen colors. Beginning with the Centurion and USA series, Liberty starts their fire ratings at a minimum of 30 minutes and moves all the way up to 2.5 hours on their Presidential and National Magnum series. 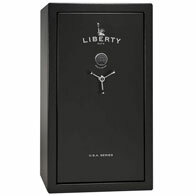 In terms of burglary, Liberty also offers the full spectrum from CA DOJ Approved handgun safes all the way up to UL RSC, Residential Security Container. Unlike other manufacturers, Liberty never skimps out on the quality of their products and they've proved this time and time again by doing side by side torture tests. In Liberty's most recent example, they took two 1,000 lb blocks of cement and dropped one on their USA, entry level series, and a competitor's safe. After watching the highly enjoyable video, you'll see the Liberty USA Safe standing strong and the competitors well... not so much. This is specifically due to Liberty's superior engineering in their roll form cold steel bodies. Since the entire safe is nearly one piece of steel, there are no weak spot welding points increasing the overall strength of the safe. New for 2018, Liberty will be adding thick military style locking bars that significantly increase the pry resistance of their safes. With constant innovation and the ability to adapt to improved methods, Liberty has and will continue to be the leader in the Gun Safe industry. Beware the gray market! Dean Safe is an Independent Factory Authorized Liberty Safe Dealer."